We are running late for the Dalai Lama. Stuck by the side of the road, outside a travel agency waiting for a taxi that should have arrived 20 min ago. Where is our driver? I’m nervous, and losing my centre. It is the first day of the Kalachakra, a week long teaching and initiation of the highest Buddhist tantra, led by His Holiness himself. We’ve planned for months, organised visas and tickets in advance, taken three planes and endured several misfortunes just for the chance to be a part of it. And now, at the last hurdle, the universe is teaching me a lesson in patience. I don’t particularly want to listen. I’m mainly worried because I want to get a good spot. Today is the first day, and we should get there early to ‘mark our territory’ so that we have a good vantage point for the rest of the week. I’m attached to the idea of getting a good spot to see the Dalai Lama. Buddhist irony much? It’s now 30 min late. We call our guy – he’s coming, 5 min away. I’m agitated. Theoretically there’s still a bit of time but I know everything in India takes longer – there will be lots of traffic, bumpy roads, a multitude of people when we arrive, security checks, navigation issues. We rise with hope as cars approach – maybe this is our car? – before watching with disappointment as each one drives away. 40 min late. An old van pulls up! Finally! 50 min late. Our driver senses our anger (not very mindful of us) and heads off quickly. Just outside of Leh we hit heavy traffic: Bumper-to-bumper cars, jeeps, vans, buses and motorbikes fill the dusty road. I’m pretty sure every vehicle in Ladakh stands between us and the venue. With barely time to spare we arrive at Choglamsar. We have to walk about a kilometre and so we hurry. We need to buy a radio for the English translation. There’s a queue for security check. We’re going to be late for sure. We enter the grounds – there’s a sea of bodies. It’s incredible. 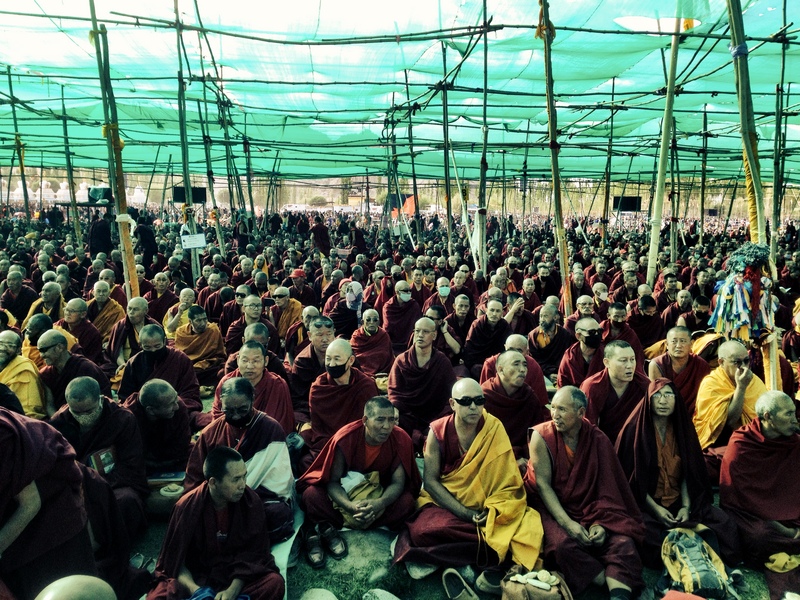 100,000 people have filled the makeshift venue for Kalachakra. The horns are blaring, the monks are chanting, people are settling into their spots and we’re rushing to the foreigner section, on the far side of the main stage. As I rush by the dais, someone appears from the shadows. It’s His Holiness! I find myself facing the dead centre of stage, 15m away, with an uninterrupted view to the Dalai Lama. He walks to the edge of the platform to greet the people. Amazing. It’s the best view I’ll get of him all week. I can’t believe it – half a minute earlier or later and I would’ve missed this moment. When we heard His Holiness would be giving a 7-day (!) 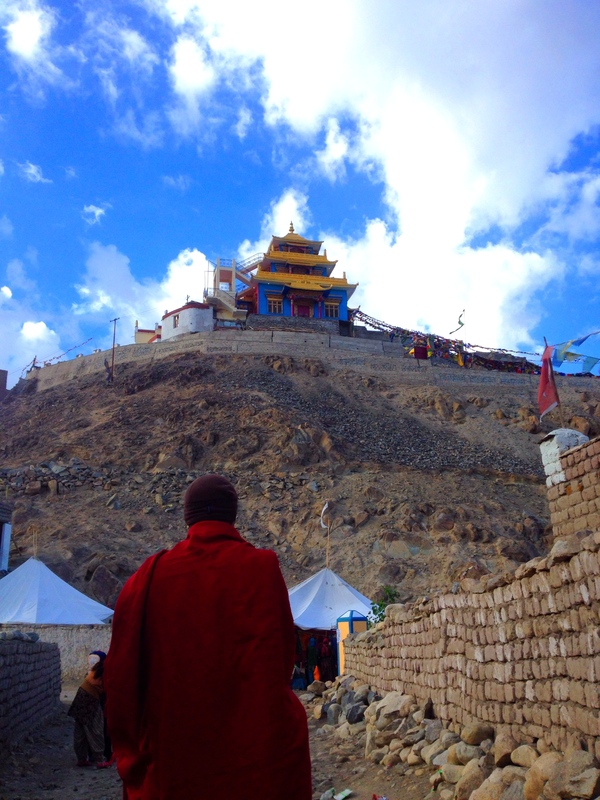 teaching on the highest Tibetan Buddhist knowledge, in Ladakh – a place probably more Tibetan than Tibet is right now – in his native language, we jumped at the chance. We figured this would probably be the most authentic experience we could have with His Holiness, short of getting in a time machine and transporting back to Lhasa,1949. This was a once in a lifetime opportunity. That said, Mesi and I, are absolute beginners when it comes to Buddhism. We don’t have a regular practice in this tradition but we grasp opportunities to learn more about it – such as doing retreats, engaging in Buddhist style meditation and reading / listening to Buddhist dharma. The schedule for the seven day event went like this: The festivities began with a celebration of His Holiness’s 79th birthday. Dignitaries, representing various religions and governments gave short speeches. The foreigners were represented by none other than our high priest, Richard Gere (Mesi was very excited by this). The next two days His Holiness gave teachings on several of Nagarjuna’s texts: Precious Garland of the Middle Way and, Letter to a Friend. Both are heady, difficult texts, mainly on the nature of emptiness. Then three more days of the Kalachakra initiation, concluding on the last day with a long life offering to His Holiness. What is Kalachakra? I’ll be honest and admit that I didn’t know much about the initiation before I got to Ladakh, and even now I don’t profess to be an expert. Suffice to say, it is a special ritual, which involves taking Buddhist vows (both the lay and the tantric ones), while performing several visualisations on a mandala. The purpose of taking the initiation is to accelerate oneself away from the cycles of Samsara. We only attended one of the three marked initiation days, deciding to go to Sakti on the first day and then skipping the last initiation day on account of the heat. We didn’t take the vows, because we’re not ready for the commitment it comes with, but for many others – particularly the local pilgrims – the Kalachakra initiation was the most important part of the week. Indeed the three days, we were told, were the most well attended days of them all. “All religions have at their base, the same fundamental principles: love, compassion, non-violence, unity” he stated. “Different religions in the world – Buddhism, Christianity, Islam, Judaism, Hinduism etc… – are just different manifestations of this same principle. The philosophical tenets are different, but the message is the same. This is a good thing because it allows people to find the one that suits them best. I’m friends with people of all faiths, and people of no faith. What is important is that we recognise each other as human beings first.”. I find these statements by His Holiness as some of the most inspiring. In a time when religious division captures much media attention, it’s rare to see the leader of a religion not only accept, but readily welcome the presence of differing spiritual philosophies. It sets a great example for the world. The Dalai Lama has had a long fascination with science particularly quantum physics and relativity, and he spent some time talking about this too. He argues, there is similarity between the Buddhist philosophy of emptiness of inherent existence and these strands of scientific thought. In a nutshell both science and Buddhism posit that there is an unseen interconnectivity between things that otherwise appear separate. The universe is more unified than we perceive. Excitingly, the Dalai Lama unveiled that he has been working on a book that takes the scattered elements of Buddhist science and collates them into one tome. It will come out around the end of this year. By the second day the proper teachings began. His Holiness jumped straight into the texts. Systematically he would quote the relevant phrases and then dissect their meaning. He talked about the four noble truths, the four mindfulnesses, bodhichitta, buddhahood, compassion, emptiness, the philosophy of the mind, single pointed concentration, dependent origination and much much more. He went at a cracking pace – this was the Dalai Lama at work. This wasn’t a typical secular speech he might give at a college graduation or at a roundtable. He was teaching dharma, the insights into buddhism he had gained from decades of study, contemplation and experience. Throughout he would sprinkle in anecdotes from his life – his experiences with monks from the Theravandan and Zen traditions, the monkeys in Dharamsala, his life in Amdo, Tibet, when he was younger. In particular he told a story about how he dealt with a group of aspiring Buddhists, in Mumbai, who asked His Holiness to teach something easy, rather than the difficult texts so common in buddhist literature. His response? A resounding no! Hard teachings were better, he reasoned, because the road to enlightenment is even harder! The Dalai Lama is a true task master. The final day saw a festive atmosphere after a long, rewarding but challenging week. A highlight of the early morning was when His Holiness transmitted the teachings on the iconic buddhist mantra Om Mani Padme Hum. He gave an explanation of every word of the short mantra and then began to lead what must’ve been a 30 min meditation on it. 150,000 people chanting Om mani padme hum – praise to the jewel in the lotus – led by the Dalai Lama himself. It was a really powerful moment, for us the highlight of the week. Like the first day, the final day involved many speeches with a particularly touching tribute from the governor of Jammu and Kashmir. The ceremony ended with His Holiness walking to the front of the stage to give his final speech. He joked to the foreigners that the event was a double blessing – seeing as it had been really hot, we had managed to get Buddhist teachings and a sun tan at the same time! The Dalai Lama is not without a sense of humour. It would be a lie to say that the Kalachakra was not without challenges. The location housed 150,000 people daily and getting in and out of the venue was hellish. People pushed and shoved their way to the exits, and there were only three bridges across a makeshift moat that created massive bottlenecks and long waits. Returning back to Leh each day was a challenge (though sometimes quite fun too), require a solid, dusty hike from the venue to the transport hub and then vying for limited taxi and bus space with the locals. Every day was an endeavour. Starting out from Leh early in the morning, finding a ride to the venue (which didn’t always appear), negotiating vehicle traffic to Choglamsar, negotiating human traffic to the teachings, listening to the teachings, and then reversing the whole process back to Leh: A solid six to seven hours and by evening we were exhausted. 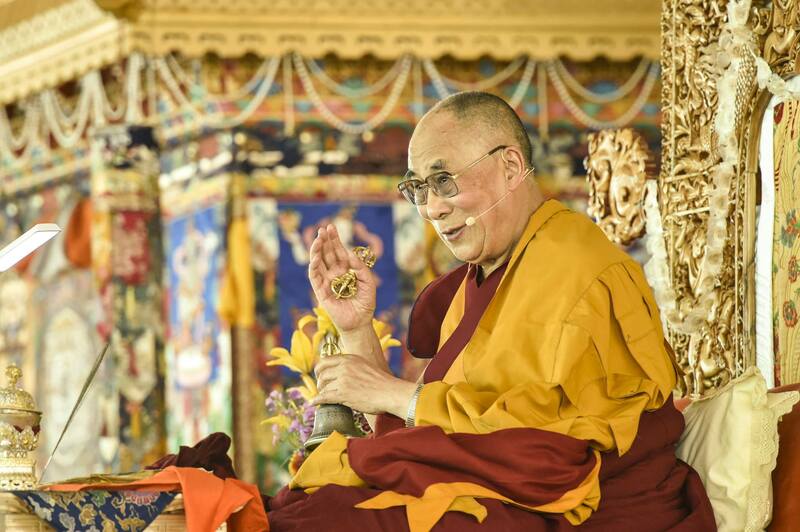 His Holiness spoke in Tibetan, and so to understand we had to use radios to tune into broadcast translations. This transmission from Dalai Lama’s words to my understanding was not always so smooth, on account of the technology, the quality of the translation and my (limited) capacity to assimilate the teachings. Add to that the length of each day’s talks – 3.5 hours – and it was difficult to maintain full attention all the way through. The heat was intense – several days started at midday and everyone was forced to endure the worst of the midday sun. At the end of the third day of teachings the Dalai Lama said: “Be humble and respectful and do not just think of yourself. Show in your actions the meaning of the teachings”. This was, for us, the main point we learned from the whole week’s teachings. His Holiness was implying: the essence of Buddhism is not the rituals, the prayers, nor the scriptures. It is how one uses the lessons of the teachings in every day life – the tricky and difficult situations you find yourself in away from the monastery, away from the meditation pillow, away from the ceremony. Can you maintain equanimity in the face of obstacles? Can you still feel compassion for the annoying people you meet throughout life? Are you aware enough to calm your mind under extreme stress? Being able to accomplish this is more important than adhering to any religion. And whenever he talks, the Dalai Lama tells his audiences that over and over again. Don’t just blindly follow anything he says – test it for yourself. Check up. The value of being around the Dalai Lama isn’t so much that he is particularly better teacher than say, another learned monk. Rather, I would argue, it’s because he embodies and lives the lessons of the Buddha – and the example he sets is so captivating, you don’t even have to be Buddhist to recognise it. When His Holiness laughs, he laughs with so much joy you can’t help but join in. When he gives teachings, uninterrupted for hours he doesn’t appear to get tired or weary. He puts full effort and attention into all that he does. He is humble. “Today I am fortunate to have woken up. I am alive, I have a precious human life.